We’re delighted to be recognised as one of Britain’s fastest growing SMEs for international sales! 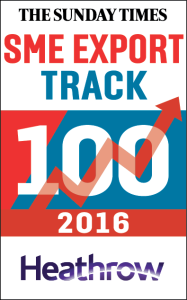 Ebury was placed eighth in the Sunday Times SME Export Track 100, a great achievement that wouldn’t have been possible without the support of our dedicated customer base and our fantastic team. Being included in the Export Track is validation of our services for SMEs. Ebury combines financial services expertise with innovative technologies to help businesses better fund and manage their international trade. We provide a unique combination of lending, currency and payment solutions to 10,000 organisations in 20 countries. SME Export Track highlighted our latest funding round, $83 million from leading tech investors, as crucial to future innovation on behalf of our clients. Our international sales growth of 162.06% a year also made us stand out from the crowd!